Our friends at MyGica are really serious about Android TV boxes. If you’re not familar, an Android TV box is sort of like a streaming box on steroids. It runs the full Android operating system so it can run most apps, not just the regular streaming ones. That means sharing content and finding video streams just a little out of the norm. 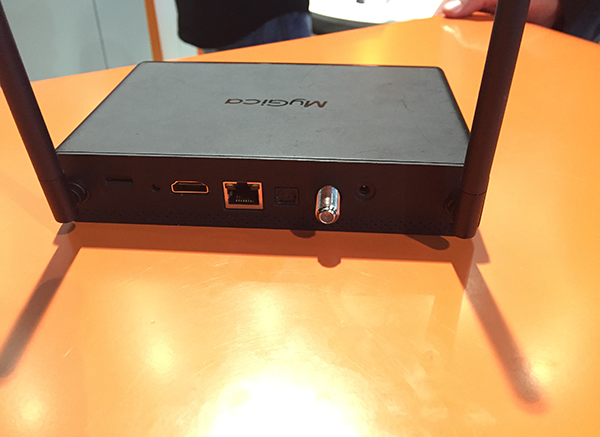 The big hit at the MyGica booth was this ATV1950 dual-tuner Android TV box. In addition to streaming duties it actually gives you two over-the-air tuners. Add an internal 2.5″ hard drive and this means you record one channel and watch another. It also supports 4K video with the H.265 HEVC codec. If you don’t need the tuners there will also be the ATV495 which brings all the streaming without the antenna inputs, at a lower price point. Both of these boxes should be available at Solid Signal in the next month, and I’ll let you know when they are in stock for immediate delivery!